So, you were driving on the interstate, and you saw something unlike anything you have ever seen. Or, maybe, you remember seeing them back in the ‘70s, or you saw a group of their owners holding a rally at a campground. Is it a van? Is it a motorhome? Where can you find out more? You are in the right place. You can be forgiven for giving up at this point. But here’s a little more detail. Back in the late 60’s and early 70’s, fuel was cheap and the family tradition of long driving vacations was in full bloom. Some used the mammoth station wagons of the day, but even after piling luggage on the roof still didn’t have enough space. And they were still bound to hotels and prevented from camping, unless they were willing to live in tents. Some bought vans, and that was the era of the custom van. My own early days were spent camping in a Volkswagen Campmobile. Maybe your experiences are similar. The next step up was a travel trailer, pulled by the family car. The average family car of the day, something like, say, an Oldsmobile Delta 88, had no trouble pulling a moderate trailer, and everyone wanted an Airstream. But pulling trailers was hard on cars, and some folks just wanted a single vehicle. Many companies answered the call, and motorhomes blossomed as a favorite choice for experienced road travelers. Most motorhomes were made the same way they are today. The motorhome company bought a chassis and drive train from a truck manufacturer, and then mounted a box on it. They looked, well, boxy. Enter GMC. GMC, as the truck division of General Motors, became eager to trade their long-term expertise in building highway and transit buses to go after the consumer market. And they needed a halo vehicle—a vehicle on which they could build their image. Even the owner of the most basic Chevrolet feels a little prouder because Chevy also makes the Corvette. As the Corvette was the halo vehicle for Chevrolet, GMC wanted something that would give the truck division a little panache. But it couldn’t be just another box on a truck chassis—there is no panache in that. So, they designed and built what is still the only motorhome that was entirely designed and built by a major automotive manufacturer. What Makes a GMC Special? The GMC Motorhome is a front-wheel-drive vehicle. It traded on the experience developed by General Motors with the Oldsmobile Toronado and Cadillac Eldorado. The engine is mounted conventionally, fore and aft, but the transmission is mounted alongside the engine instead of behind it, and it is connected to the engine by a large chain drive. The axles go to the front wheels under the forward part of the engine. And this was the era of big engines. The GMC was initially outfitted with the same engine used in the Olds Toronado—a 455-cubic-inch V8. That’s 7.4 liters. In the last year of production, they downsized to a “small” engine, a 403 cid V8. With the entire drive train in the forward-most eight feet of the vehicle, there was no need for a high floor behind the cockpit. So, they placed the floor at 14 inches above the ground. The GMC is still the only full-size motorhome that does not really require a step, though some folks use them to make it even easier to step up into the house. With no drive axle in the rear, the rear suspension could be bolted alongside the frame rather than under it. The GMC used tandem rear wheels with bogie arms that kept the suspension in the outboard foot and a half of the body. Thus, there is no step up to get over a rear axle. The wheel wells were placed under counters and at the back of closets to hide them. The rear suspension was designed to ride on air bags, and the height is automatically controlled and adjustable for leveling the vehicle at a campsite. A low floor means a low roof. Even though the GMC has a ceiling of 76 inches, the roofline is only eight feet high, plus the air conditioner and other roof-mounted amenities. 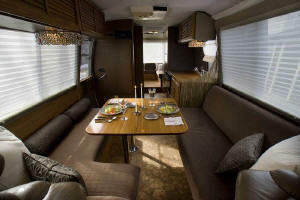 The body also differs from conventional motorhome design. General Motors had already established the ability to mold fiberglass panels into body shapes for the Corvette. 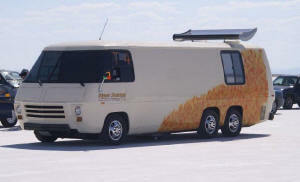 The GMC Motorhome’s nose, tail, and the panels below the waistline were molded at high pressure from fiberglass sheets. The upper sides and the roof were heavy-gauge aluminum body panels to keep weight down. These panels were attached to a frame of high-strength extruded aluminum using special epoxy adhesives that were later used on GMC transit buses. Only the floor is made from wood. 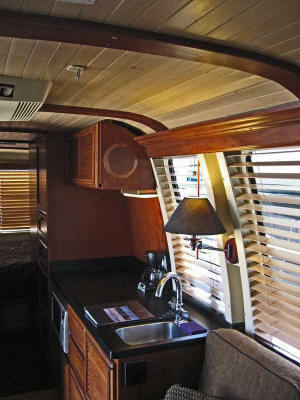 Conventional motorhomes, then and now, use wood frames, and water leaks usually result in fatal rot. Many GMC’s have been resurrected from junkyards after years of neglect, and brought back to life at far less cost than a new motorhome of the same size. 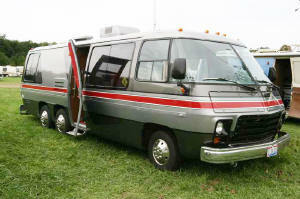 Unlike most motorhomes, the GMC Motorhome received the full styling treatment from the General Motors expert designers. They rendered and displayed concept vehicles, built small and large models from wood and clay, and experimented with several different styling approaches before settling on the familiar shape with the low waistline and curved sides. The GMC still has superior aerodynamic performance for a motorhome, and the design, though a product of the 70’s, has achieved a timeless quality—most people are surprised when they learn the GMC’s vintage. 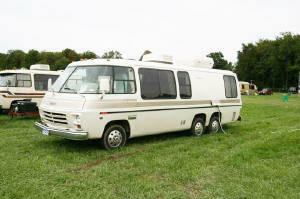 That low waistline allowed GM designers to revolutionize motorhome design by providing a large number of huge windows. 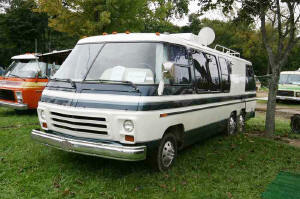 Before the GMC, windows in motorhomes were small and few. Afterwards, even custom vans had to have windows that extended all the way down to the waist. GMC Motorhomes come in two lengths. The standard model was 26 feet long, and by far most of the coaches built were this length. GMC Motorhomes of that size nominally provide sleeping accommodations for six in factory trim. The GMCs with interiors built by GMC have bathrooms on the side of the coach adjacent to the wheel well, and an entrance door just in front of the rear wheels. They typically have a rear bedroom and a front galley/lounge, separated by the bathroom, closet, shelf units, and the refrigerator. 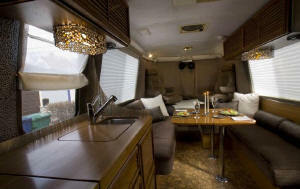 Some GMCs had their interiors built by a range of other motorhome builders. In these cases, the motorhome builder bought the shell (called a Transmode) from GM and added the interior, offering different finish materials and different floor plans than in the factory up-fitted motorhomes. Transmodes were made into a variety of vehicles, ranging from airport people-movers to mobile post offices. The smaller version was 23 feet long. It was identical to the longer coach, except that it had 20 fewer inches between the front and rear wheels, and 16 fewer inches behind the rear wheels. They usually had sleeping accommodations for four, but most folks these days think of them as ideal for a traveling couple. Some 23-foot Motorhomes have a rear bedroom, and some have a bathroom in the rear and combine the bedroom, galley, and lounge. 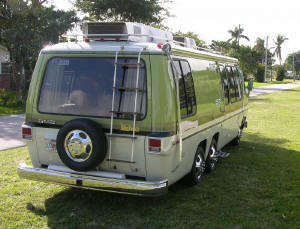 All GMC Motorhomes were eight feet wide at the waist, which was the maximum legal limit when they were made. In these days of 40-foot diesel pusher motorhomes, the GMC Motorhome may seem small. But they seem larger on the inside, and their external proportions keep them sleek without the boxiness of most smaller motorhomes. The interior design was the pinnacle of 1970’s décor, as vetted and approved by Better Homes and Gardens. Some owners keep the original décor as a reminder of iconic 70’s style, and others start over. Many consider a GMC to be a blank canvas, and they might be outfitted like a weekend camper, an airplane, or even a fine yacht. The GMC Motorhome is a real motorhome. They have a full bathroom (usually a wet bathroom, though some models have a separate shower stall), a bedroom, a living room, and a kitchen with a sink, oven, cook top, and refrigerator. They have air conditioners and water heaters, and most are equipped with a generator in one rear compartment, and a propane tank in the other rear compartment. They hold (with some variations) 36 gallons of fresh water, 36 gallons of waste, and 50 gallons of fuel. 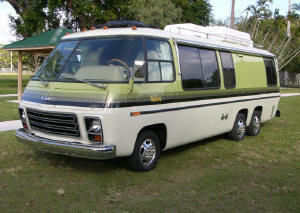 General Motors offered the first Motorhome for sale as a 1973 model, in late 1972. They continued to build them for six years, through the 1978 model year. Total production approached 13,000 units, a large percentage of which are still on the road. Production ceased because of a double-whammy: The second oil embargo (temporarily) undermined motorhome popularity, and Oldsmobile stopped making the 455 engine and heavy-duty front-wheel drive train. Very nicely, thank you. In good condition, a GMC drives like a big van, and not at all like a truck. The tandem rear suspension steps over bumps instead of being launched by them. 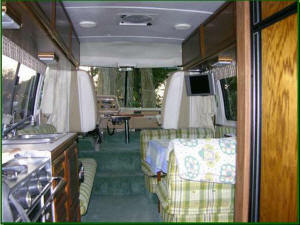 The Motorhome is equipped with power steering, power brakes (disks on the front), and an automatic transmission. The front suspension uses torsion bars. 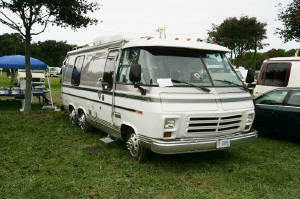 The GMC was and is known for having the smoothest ride of any motorhome. They are smaller than they seem and can be parked in regular lots (usually needing two spaces side by side). GMC Motorhomes have big engines, and invite their owners to enjoy their smoothness and power. Those who keep their engines in top form and, well, restrain themselves see fuel mileage in the range of nine or ten miles per gallon of regular unleaded fuel. That is comparable to many other motorhomes. If you find it a little too much fun to leave other motorhomes in the dust, you might not fare quite as well. The GMC Motorhome continues to be de rigeur at automobile race tracks as the motorhome of choice for the performance-car enthusiast. Guess which motorhome owns the world land speed record for a motorhome? Yes, the GMC. So, Can You Buy A GMC? 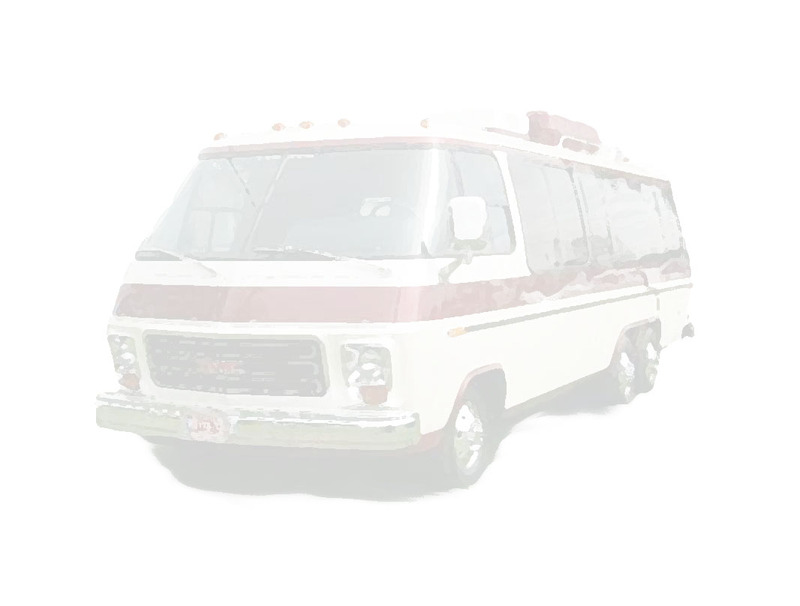 GMC Motorhomes in a wide range of condition are available at any given time. Some are junkyard specials that will provide a satisfying restoration and renovation experience for the hobbyist. At the other end of the scale, fully renewed and renovated motorhomes are available that have had every element replaced and renewed, inside and out. They have new interiors, new drive trains, new paint, new windows, new wheels and tires—new everything. The price for these is competitive with new motorhomes, and usually provide an extra level of luxury and durability compared to the new market. Most used GMC’s are somewhere in between these extremes. But buying one is not as risky as it might seem, because any prospective buyer can nearly always get assistance from an established GMC owner in the area when considering a particular coach. And obtaining parts for a GMC is usually as easy as buying parts for a mid-70’s Olds Toronado. Specialty parts are available from a variety of sources, many of which exclusively support the GMC community. Links to the commercial refurbishers and parts suppliers can be found in the links on “Bdub’s Site”, as it is known in the community, which is maintained by GMC owner Billy Massey. In addition to parts suppliers, Bdub’s site also provides access to the GMC Motorhome Maintenance Manuals, and the Parts Manual. Full documentation for any common GMC repair is a few clicks away. If your sighting of a GMC Motorhome sparked an interest, and after a few days you find you just can’t get it out of your mind, don’t feel alone. Join GMCnet and introduce yourself. You’ll find that current GMC owners are happy to welcome new and prospective owners, and will provide you an endless supply of cheerful advice to support your interest in enjoying the rewards of owning a classic GMC Motorhome. ©2008 Rick Denney. All Rights Reserved.